very fine indeed Mike. she looks excellent. Thanks Bob. It owes a lot to the kit itself. I recommend highly. I've started back up on my machine shop. Machines have been blackened, polished with steel wool, and painted in various muted shades of gray-green and green-gray, except for the drill press in dark blue. Most machines are built except for the wheel press. I've not worked on the little stationary steam engine in the lower left corner of the photo. The boiler will be in an attached building. I've also planked most of the floor except between where rails will go to allow adjustment when this building is attached to the adjacent structure. I've scoured the web for pictures of actual shops and also visited a small shop in Salem, OR when we were out there this summer for the NMRA convention. I've also read Bob Harris's construction of his machine shop (http://www.railroad-line.com/forum/topic.asp?TOPIC_ID=30407) as well as others. I have a question that maybe somebody on here can answer: How does the wheel press work? I have the Rio Grande wheel press, and it looks like pictures I've seen, but also looks incomplete. Pictures have various wheels and drawings of one in the Sierra Machine shop has one attached by a belt to a wheel on the drive shaft; the model does not. How does the hydraulics work? Do I need a compressor of some sort? I'm thinking not. The instructions do not call for bracing and no material is included, but I saw little irregularities in the walls and decided to do some bracing. Also, I think the styrene overlays representing brick could cause problems down the road with one side being sealed and the other not, although I did prime both sides of each wall. So, a trip to a local Michael's art store. You can see I like robust bracing; makes for a solid structure. I'm not sure whether it's going to be a school or some other type of building. Hi Mike, I hope your enjoyed you read of my shop build. The Rio Grade model of a Wheel press does need a compressor. Mine is going into a corner of the wood shop a la' the Sierra RR. Thanks for the info on the wheel press. I tried to find out from the book on the Sierra shop but I might have missed that bit. Yes, I enjoyed reading your building thread again--for the second time--with all its drama: the hero sets out on his journey with words of encouragement, all goes well until the tragedy of the fallen line shaft, the hero recovers and sails on, a couple of minor setbacks, ends in victory. Seriously, threads like yours are constant sources of reference for me. I envy the builders in larger scales with beautiful machinery, but I'm sticking with HO. Although very careful putting the four walls together, my model had a little wobble when sitting on a flat surface. With the roof attached the wobble went away. I'm going to brace the underside of the roof to make it nice and solid for when I glue on the "slates." Then, I believe the brick veneer is next. After finishing the basic structure, I glued on the styrene sheets with canopy glue. The instructions say to rough up the backs with sandpaper, and boy was that necessary! I forgot on one sheet and the glue started to bead up. I quickly washed it off and did as I was instructed. For some reason the manufacturer cut the windows on the front about a foot too high. They didn't look right; looking at photos of the prototype revealed the problem. I extended the openings in the wood substructure and decided my building will have a fascia under the eaves. That allows me to move the styrene sheet downward. Excuse the photo. The light available is not very good and I held the model up near a ceiling with one hand as I took the picture with the other. The school house is looking Good. It's nice the locals could afford brick. I suspect most schools were frame, but it's not too hard to find examples of brick ones. Within a couple of miles of where I'm sitting near Lansing MI is a nice example very similar to the kit I'm building. As I switch off between working on my schoolhouse over lunch and my machine shop in the evening, I do have some in-progress photos of the kit. I went to Michael's to get an acrylic paint in raw sienna to represent brick. This color is actually very close to PolyScale "rust" recommended as a good historic brick color by John Nehrich way back, probably the 1980's. 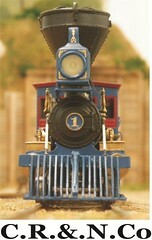 Charlie Getz reviewed this kit in the latest Narrow Gauge and Short Line Gazette and noted a couple of issues. I've found a few of my own, partly due to my preferences in kits. He noted that the hole in the roof for the chimney is too small and substituted a casting he had on hand, but I decided to enlarge the hole instead. I also built a simple platform for the chimney casting to sit on to be able to secure it in place better. If you look closely you can see where I inserted 4 by 4 stripwood to form a solid ridge. The kit makes no provision to fill this space and I was afraid leaving it unfilled could lead to an uneven ridgetop once the "slate" roofing was applied even with some kind of ridge cap. I've also constructed most of the cupola and have the same issue with gaps between pieces. I'm thinking of a green for trim. Back to working on my machine shop. I've started working on the end walls, one which will connect with the car shop. Here can be seen the basic framework of one end, which will have two windows. I'm installing the vertical siding first, then cutting out openings for the windows. I made jigs to space the horizontal members of the frame, the distance between the sill and the bottom of the window opening, and the width and top of the opening. This photo shows two of the jigs. Thank you. I'm trying to proceed carefully since this is a scratchbuild largely out of my imagination. Nevertheless, last night when I should have been sleeping I realized I made no provision for a door into the boiler room behind this wall. Suddenly fully awake! I did resist the temptation to run down to my workshop and figure out what needed to be done. Nice progress Mike and looking good. Neat idea on the chimney support.